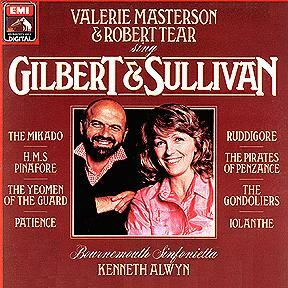 In 1982, EMI published an album of G&S solos and duets featuring Valerie Masterson, the former D'Oyly Carte soprano, and Robert Tear, an English grand opera tenor with little G&S background. Most of the items were G&S staples, with a couple of items from Ruddigore being as adventurous as the disc got. In 1984, EMI published a considerably more interesting highlights disc called "Here's a How-De-Do" featuring Tear, Sheila Armstrong and Benjamin Luxon. Robert Tear is the common denominator between the two discs, and I find him unpersuasive: his interpretation is a bit too precious; he lacks the swagger I expect in a G&S tenor. The remaining performers are all excellent, and the second disc has the additional virtue of presenting a number of items not often heard on records, particularly two items from Haddon Hall. 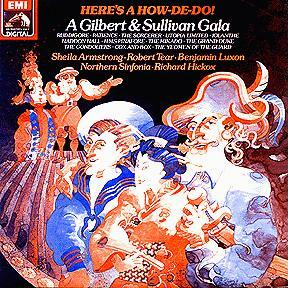 In 1987, EMI combined material from the two original LPs into a CD issue called "A Gilbert & Sullivan Gala." Some items were dropped, however, so that the entire package could fit on a single CD. The contents of the two LPs are listed below, with asterisks denoting the items included on the CD. Singers' initials are given after each number. Bournemouth Sinfonietta, Kenneth Alwyn, conductor. Northern Sinfonia of England, Richard Hickox, conductor.